If you like to use facial products that have no nasty chemicals, just ingredients that are there to help your skin. Arbonne has a great reputation for being a top quality skin care product. I have not yet had the pleasure of trying them but I’ve heard great things! Summer is almost here and I’m sure you are ready for some fun in the sun! I know I am always about sun safety for the kids, but what about us? Is your day creme helping you fight the signs of aging and protecting you for the damaging UV rays? 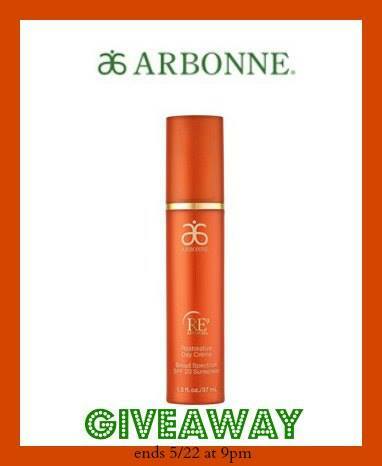 Well, tonight I have a great giveaway for you guys to take care of your skin with Arbonne! What is Arbonne? The idea to provide skin care products unparalleled in quality and effectiveness developed in Switzerland in 1975, is what Arbonne is today. Enter on the Rafflecopter below to win RE9 Advanced Extra Moisture Restorative Day Creme Broad Spectrum SPF 20 Sunscreen. At this time I am using Eucerin Facial moisturizer with SPF for the day time and ROC Night for the night. I love to try new brands all the time though! I’ve used cleanser, toner, and moisturizer for 30 years. I use a facial cleanser with a soft scrubber brush. Then I use a good anti-aging moisturizer. I do not use harsh chemicals on my skin. WARM water and coconut oil are what I use. My wife loves anything that will erase a few years! Unfortunately i have to switch up products because either they start drying my skin or make me break out. I haven’t found the right one yet. I have been looking for a new skin care line that I love. I have dry skin and recently started using Mary Kay brand products. I use Simple facial cleanser and lot’s of moisturizer! I used to sell it many years ago! I’ve been using Simple facial cleaner. Right now I am using Shaklee skin care cleaner, toner and moisturizer and I am loving how my skin is coming up. It’s never felt so smooth and soft and it is really helping out my dry skin issues. I like to use Olay moisturizers on my face. I mostly use Olay products. IVe been using Avon Anew for many many years but I feel like maybe I need a change and I’ve only heard good things about Arbonne so i’ am only going to try it and see what results I get. My favorite skincare brand is Mary Kay. I have heard good things about Arbonne though. Currently, I use either Argan Oil or Coconut oil to moisturize my face at night. I use dove products right now. I actually do not use anything right now. Right now I am into natural care- coconut oil for moisturizer and a baking soda/coconut oil face wash. I usually use Tea Tree products from the Body Shop and Avon products for my face. i am good with biore and dove… this would be for my sister. I like Clinique products and Oil of Olay. I love Neo Strata products; they have consistently been such a great line for me for years. I like Elmiplant products and the Beautiful AM Moisturizer. I love Nuxe Creme Fraiche! it smells so good! I love St Ives apricot scrub and Ponds! I actually just tried Arbonne for the first time the other night and fell in love with everything I tried. I am crossing my fingers for this one.